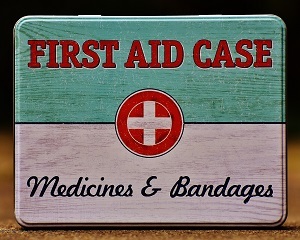 It is my humble belief that every household should have a first aid herbal kit handy for treating minor injuries or ailments or even provide short-term treatment before professional care is available. In this post, I will explore the benefits of herbal first aid and 12 essential herbs for the home that can speed up and help minor injuries such as cuts, bruises, bites and burns. In a domestic emergency, most of us are inclined to reach for conventional medicines such as antiseptics or painkillers than herbal medicines. Yet, when properly administered, herbs can be just as effective as and sometimes more effective than their pharmaceutical cousins when applied in first aid. ACT immediately when someone is injured. UNDERSTAND the reasons for a specific herbal medicine being used and what outcomes to expect. CHOOSE the most suitable method, for example – Tea; Tincture; Tablet; Ointment; Oil; Compress; Wash.
MONITOR the affect of the treatment – keep notes so that you can provide as much info as possible if you need to seek professional help. BE PATIENT and be prepared to continue the treatment for longer if necessary. SERIOUSNESS – if the condition is serious, for example – breaks or falls resulting in back/neck injury or if the condition suddenly changes or worsens – ALWAYS seek professional medical help. STAY CALM – this will help the injured person in the long term! Panicking will just exacerbate the situation and create more unnecessary negative energy. 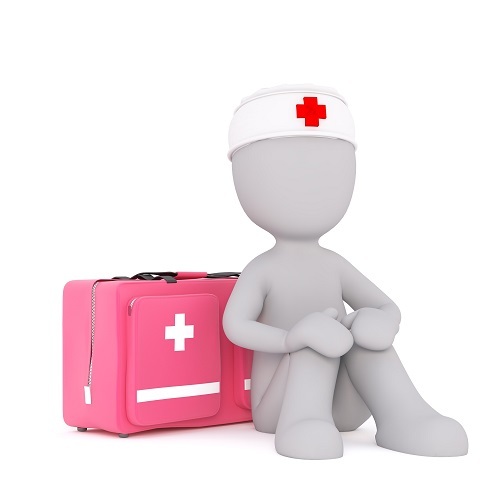 Lessen the discomfort of minor injuries/conditions to the wounded person. A first aid herbal kit in the home is incredibly useful for when waiting for professional assistance. When deciding on what products to stock, you should consider the needs of you and your family. What are the common problems you or they experience? Due to its antiseptic and anti-inflammatory properties, the gel is an excellent first aid remedy for minor burns, scalds, sunburn and skin abrasions. Fresh gel from a cut leaf can be kept in the fridge too as its soothing properties coats the skin, cools it and protects it. It can also help ease any pain and swelling, help repair damaged cells and help prevent scarring. The topical use of Arnica for bruises is instantly satisfying. When applied immediately after a bump or bruise, it can decrease swelling in moments due to its anti-inflammatory and analgesic actions. It can also help relieve chilblains, sprains and rheumatic pain. CAUTION – should only be used externally (and if the skin is not broken) as it is toxic it taken internally (except in Homeopathy). 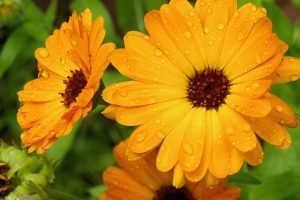 Marigold possess antiseptic and antimicrobial actions that can help to heal wounds. Used externally, it can also help relieve infections, dry eczema, cuts, grazes and sores. Its astringent action can help stop bleeding from cuts and its anti-inflammatory actions can be used to soothe minor burns, scalds and inflammation. Used as a wash, it makes for a potent skin wash to tough skin eruptions such as measles and chicken pox in order to dry and heal them. Clove oil has powerful antiseptic and mild aesthetic properties and is usually used externally in the treatment of toothache. The oil is also good for cuts and skin conditions such as acne, rashes and blemishes. It can also be used to alleviate nausea, vomiting and gas. Crystallized Ginger is particularly useful for motion sickness, morning sickness, car sickness and nausea due to its anti-emetic properties. It is also an excellent remedy for fever, colds and chills. As a stimulant, it helps to stimulate the circulation and as a diaphoretic, it will bring out a good sweat. Perfect to rid a cold or fever quickly. In its native Australia and Tasmania surroundings, it is known as The Fever Tree, because it is a powerful antimicrobial and bacteria fighter wherever it grows. 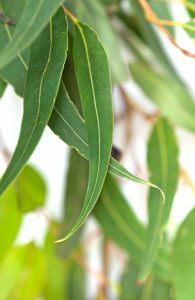 Eucalyptus also contains powerful antiseptic actions and can provide relief from colds, coughs and respiratory infections. It has been used as a steam inhalant for chest congestion. Steam from the plant has been used to kill bacteria and microbes and to clean the air in sickrooms. The infused oil will help heal minor burns and sunburn thanks to its anti-inflammatory and analgesic properties. However, once applied to the skin, it SHOULD NOT be re-exposed to sunlight again as this can intensify the burn. The oil can help to relax muscles, reduce inflammation and ease pains in the nerves for neuralgia and neuritis. Its anti-inflammatory properties can be beneficial as a wash on wounds, skin sores, bruises and varicose veins. The bark of Slippery Elm is considered one of the best poultices to soothe inflammation; draw out splinters and impurities from the skin; speed up healing and restore the tissue’s integrity due to its emollient and vulnerary properties. Its demulcent actions makes it an important ingredient in many cough formulas, and when combined with powdered Ginger and Liquorice, it makes excellent lozenges. Thanks to its anti-inflammatory properties, Lavender oil is the only oil that can be used neat on the skin to take the pain out of stings, minor burns, scalds and sunburn. Used in a tea, it is an antiseptic that can be used as a healing wash for wounds. Like Aloe Vera, it is an excellent herb to use to ease any pain and swelling; to help repair damaged cells; to prevent scarring, plus it can help to deter infection. Lavender’s sedative and relaxant properties can be used to promote and soothe natural sleep, relieve tension headaches and migraines and calm frayed nerves and anxiety. This has to be one of my favourites as it’s so useful when dealing with a child! Tea Tree oil’s antiseptic, antibacterial and anti-inflammatory actions are useful for cleansing wounds, cuts, sores and abrasions. It is also useful for acne, head lice, cold sores, sunburn and insect bites. Witch Hazel can be used to aid the healing of minor burns, sunburn and insect bites due to its anti-inflammatory and vulnerary actions. Cuts can be washed with it to help cleanse them and soaking a swab in Witch Hazel can help stop the flow of blood (externally and internally) as it contains astringent properties. 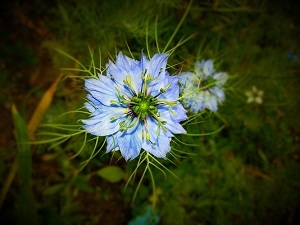 Black Seed Oil has been hailed by some as “a true panacea”, “a universal healer” and “a miracle herb”. It’s been prized for centuries by ancient cultures for the treatment of a wide range of ailments. It’s excellent for calming minor burns, insect bites, stings, bruises and bumps. Some of its actions include anti-bacterial; anti-fungal; analgesic; anti-microbial; anti-inflammatory and diuretic to name a few. Herbal traditions have been passed down from one generation to the next. This is because they are so effective and easy to obtain and prepare. Herbal medicines are not only prescribed for illnesses – they are well suited for first aid and other purposes at home. In fact, for centuries, up to the discovery of penicillin (1928) and the formation of the NHS (National Health Service -1948), the traditional way to treat situations requiring immediate attention was the use of herbal medicine. Do you have a first aid herbal kit for the home? Have you used any of the herbs mentioned above at home? If so, what did you use? Did it help? I’d love to hear your comments and thoughts. Thanks for reading! Peace be with you. 12 Essential Herbs For The Home - Discover the 12 essential herbs for the first aid herbal kit including guidelines in using these herbs for home treatment. So happy you found the article helpful Baldo – and love the fact you use the herbs mentioned. Lavender is one my favourites – I use a few drops on my pillow to help me sleep too and it’s great for calming and soothing kids too. And it seems dogs for that matter! Have a great weekend. Wow, this is such a great and detailed article about herbs and their goodness. I am a great fan of lavender and use it as well, I also have a lavender pillow spray which works amazing in relaxing me when on bed. I will try other herbs that you have explained as well. Thank you so much for sharing such a nice article. I’m really happy you liked the article. Lavender is one of my favourites too – a few drops on the pillow works wonders for aiding sleep. Great for calming kids too! Hope you get to use the other herbs mentioned and feel free to return and share your experiences. Have a great week. Thank you for taking time to research and make this post, Teresa. Actually, herbal medicines are very useful, as they do not have side effects like the traditional chemical ones. Also, having a herbal first aid box may help rescuing somebody’s life until he goes for medical check in a hospital or a clinic. You’re most welcome. Yes, having a first aid herbal kit is definitely handy for minor injuries until professional care is available. Although I would like to point out that being natural is not synonymous with being safe or harmless and this goes with herbal medicines too especially when dealing with pregnant women and children. Thanks for reading. This is an excellent post! I believe herbal medicines are more powerful than conventional ones and I agree every household should hold essential herbs. I found Arnica (homeopathy) to be an excellent painkiller after surgery and Aloe Vera to be very useful for abdominal pain. Thanks for the great read! thanks for sharing your thoughts and comments on the post. I haven’t come across Aloe Vera for abdominal pain before as I tend to use it externally and would love to know what kind of Aloe Vera you used to treat this? I used Aloe Vera Juice, it also helps to treat reflux and ulcer. It is safe for internal usage except for the people with diabetes and pregnant women I think. Thanks Blanka for your response. It’s good to know how some herbs are used for other ailments that they aren’t usually associated with. Power to the plants! Love this post! As someone who relies on all things natural, this post will come in handy. I used to use the Bach remedies a lot and will be buying them again. I also love the info you posted about lavender. I never knew that it is used for burns and skin irritations. Really valuable information. Thank you! really happy you found the post useful and good to her you rely on all things natural! Yes, Lavender is such a beautiful and versatile herb and works wonders on calming kids too. Have a great week. I am totally bookmakring this page! I have a few on the list and use them all the time and preach the natural health kit to everyone myself. Will certainly be looking into Marigold. Thanks for the insightful info! You’re most welcome Tamara. Thanks for stopping by! It’s so true! – Every culture, past and present, has relied on the diverse array of healing plants for their therapeutic and beneficial properties. Plants are the basis upon which all living things depend on. Whether it is directly or indirectly, humankind relies on plants for food, oxygen, clothing, fuel, building materials and medicine. Have a lovely weekend. Thank you for your great article! I really enjoyed the read and learned a lot. I liked your idea of having a first aid herbal kit instead of conventional medicines. You mention 12 herbs in your article. Have to admit that I am familiar with just a few of them. As far as I can see, some of these herbs have the same or similar purpose. For example Aloe Vera, Marigold, Lavender, Tea Tree are all antiseptic and anti-inflammatory. It’s a bit confusing… Which one do you suggest for wounds? Which one is the most effective in your opinion? that’s a great question and really depends upon the situation. Personally for wounds and small cuts, I would reach for the Aloe Vera as it’s great for preventing scarring too. If the wound was bleeding, then I would make a Marigold wash to help stop the bleeding. If it was a child who has the wound, then I would use Lavender as it is wonderfully calming for an upset child. For a burst spot on the face, then Tea Tree would be ideal. I hope that helps and have a lovely weekend. You mention how these all benefit us in a non-emergency situation but what kind of shelf life does something generally have before it would be ineffective? I am curious about a few of these especially Lavender and wanted to know what is the best way to use it to reduce stress or anxiety? Adding some of these does seem like a really good idea have a first aid herbal kit or even just in the medicine cabinet by themselves. That’s a really good question – dependant upon which ones you have, it can range from 1-4 years. Because they are volatile substances, this means they will evaporate. Light, oxygen and heat are the main issues that will cause the essential oils to loose its potency and go rancid. 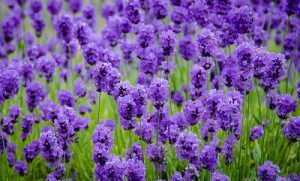 I find drinking Lavender in a tea or having a few drops on clothing where you can smell it can help with stress or anxiety. Alternatively, using tinctures is another way as they are easy to use, well absorbed and versatile in application. We are living in such a stressful and hectic way of life at times and going for something natural to unwind is your best option. I hope you find a solution and feel free to pop by. I’m really glad you found the post useful and thanks for your suggestion. They are always welcome here! Before I comment on the article I thought your color theme and background looked really good in your post. 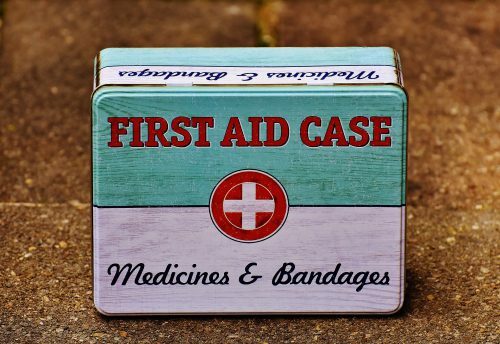 Your idea for the holistic first aid kit is a really good one that I will be using in the future for outdoor adventures. I have tried a number of the remedies you mentioned and they do work good and I’m looking forward to trying the rest. They really are a handy kit to have a round and if you’re in the great outdoors, then even better – God’s pharmacy all around you! I would love to know how you get on with the other remedies mentioned so don’t hesitate to pop by. Enjoy your weekend. How do you use the marigold flower, by making a paste out of it and how to store it? I’m curious about marigold as there are a bunch in our backyard and we are always looking for some use of these flowers. I would never have guessed it has so many properties, this is a wonderful list would try and include them all in our house. I usually use dried Marigold and drink it as a tea or use as a wash as it’s very good for dry skin. Of course you can use your freshly grown Marigold for this too. To store, I would generally dry it out first completely and put in jars away from sunlight and it’ll keep 1-2 years. I hope you find a way to use it and let me know of your outcomes. Nature offers us all we need, one only has to look. Sadly in these modern times, men have turned away from nature and rely on man-made medicine. Big Pharma does not want us to get healthy at all, as long as we are sick they earn money at the cost of our health. That is why your website is so needed, it informs people of healthy and natural alternatives. you’re most welcome….and I agree – Big Pharma is BIG BUSINESS and business means money. It’s so sad that we live in one of the wealthiest nations on the planet yet we are considered the sickest. The amount of money spent in Big Pharma to keep us sick and in business is absolutely shocking and it is my hope that health sites like mine can empower people to become more in tune with their health and how to look after themselves using wisdom and knowledge passed down from generation after generation. Thanks for stopping by. I really enjoy learning about natural herbal/natural treatments. I just recently learned about dandelion tea and its many benefits. It’s amazing that God gave us natural medicine to use and sad that most doctors aren’t really knowledgeable about most of it, because they are trained in the pharmaceutical realm of things. My first choice is always to try natural first. Thanks for the great information. My belief is that herbs have been placed on this earth for us to discover and make use of and to further our knowledge into the wonders of this expansive yet fragile world we live in. It truly is a shame that doctors are trained by Big Pharma – money and profit over health. So glad you take the natural approach. Have a lovely day. What a good idea to have this first aid kit at home. I know most of the things you mention and have used quite a few myself. 2 of them I especially like. Tea Tree: It is many years ago when I had a bad wound on top of my foot. I treated it with Tea Tree oil and it healed very nicely. My personal favorite is Aloe Vera which I have used for many years. I have a few plants in the garden of Aloe Vera Barbadensis which is the special healing one. Just a small cut in the leaf and use the gel which comes out. The plant will heal its own wound. If you cut the leaf off one cannot keep it too long as the air oxidizes the gel and like that it loses its healing properties. Aloe is definitely one of my favourites as it has helped in so many ways and is also fantastic for healing scars. Lavender is up there on my list too – great for natural sleep and using on restless children. Thanks for reading. I knew about half of these but the others I had no clue. I actually grow Aloe and Lavender in my garden. I live in Florida so the Aloe comes in handy with sunburns. The lavender I really like the smell of it in my garden. I rather use something natural like these herbs you have listed then medicine. I will bookmark your website so I can refer back to it. Not sure if you know the answer to this but I have seen Aloe in my fruit section of the grocery store. Do you know if you can really eat Aloe? It’s great to hear you use plants as medicine and have some lovely and beneficial plants growing in your garden. Internally, the leaves are good for constipation. They also help to stimulate bile flow and digestion and can be useful in poor appetite. 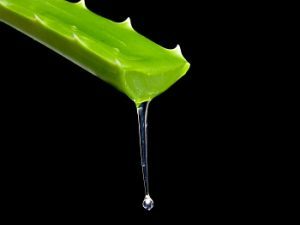 Both the gel and the juice come from the Aloe leaves and as a rule, the gel is NOT used internally, but the juice has a long history of being used internally. Care should be taken if pregnant or breastfeeding as it can stimulate uterine contractions and act as purgative ( a very strong laxative) to the breastfeeding baby. Hope this helps…Have a lovely weekend. Wow! This page was amazing! I am all for healing the natural way, even though I study medicine. Most of these I hadn’t even heard about yet! I’ll be sure to try some of these out soon. I’m really glad you found the post useful. Using herbs as treatment for first aid at home is incredibly beneficial and effective. I would love to hear how you use these herbs in the future, especially as you are studying medicine. Thanks for stopping by.